Damsels Dont Wear Glasses is an action/urban fantasy series about a tough, dry-humored woman named Lave Faraday, who also happens to live in a city populated by mythical creatures and magic. After taking down a horde of zombies (slightly unusual for a Monday) Lave is tasked with looking after a 12 year old boy named Jake. for reasons no-one will tell her. Never Trust a Title: Lave does wear glasses. Urban Fantasy: There are haunted clothes driving taxis and snake people working admin jobs. Mundane Fantastic: Magic is something you have to pay to use and necromancy is more a scandal in the news than a big supernatural event. Badass and Child Duo: Lave and Jake. Action Girl: Lave deals with zombies by running them through with her sword, throwing them off a wall, and simply bashing them together. Blind Without 'Em: Our heroine is near-sighted. Not that it will stop her from fighting with a bunch of blurry figures. Bare Your Midriff: Lave's not too shy about walking around in a sports bra. Black Magic: In chapter one, Kest attempts to use black magic (necromancy, specifically), which backfires on him considerably. Deadpan Snarker: Lave certainly has no trouble mocking her subjects even as shes apprehending them. Demonic Possession: Kest ends up falling victim to this at the end of chapter 1. Dropped Glasses: As early as the first chapter. It's hard to fight with glasses without them getting knocked off of your face once in a while. Establishing Character Moment: Lave makes her debut saving a goat from being sacrificed, and casually greeting the guy shes stopping, while petting the goat. Everything's Deader with Zombies: Just one of the paranormal beings present here. Extreme Omni-Goat: The sacrificial goat escapes by eating its leash. Fiery Red Head: Lave: red-haired, combative daredevil. Hermetic Magic: Kest's spell requires a magic circle, candles, an orb, a spellbook, a skull, a knife, a goat, and enough time that his audience gets bored. I Have the High Ground: Lave often perches atop trees, walls, posts, or a telephone pole. In Harm's Way: Lave enjoys danger. Kest does not. Lave: Pretty exciting night we're having, huh? Instant Runes: Appearing on the bodies of the undead. Kest: This tastes like carbonated nail polish. Pet The Goat: Lave is abrasive to humans, but not to the goat. Power Crystal: Kest's magical orb apparently stores some sort of magical energy. 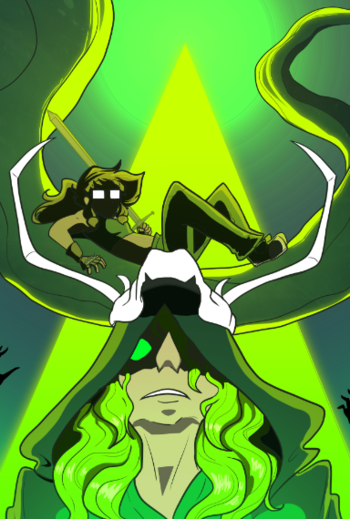 Power Glows: Necromancy glows green. Removing the Head or Destroying the Brain: Unfortunately for Kest, in chapter 1 this is subverted, and the undead spirit possessing what was previously thought to be your run-of-the-mill zombie keeps on going without a physical head . Even Lave is shocked by this. Rise from Your Grave: Zombies erupt from the cemetery in the classic manner. Screw This, I'm Outta Here! : The rest of the cultists book it when things go wrong. Sickly Green Glow: Indicating black magic is at work here. Zombie Infectee: Kest develops a suspicious green filigree after being bitten. Arson, Murder, and Lifesaving: Despite saving a life in chapter one, Lave is put on probation in the second chapter. Fish out of Water: It's pretty clear Jake is not used to the none humans walking around. Intellectual Animal: Lave's roommate is a giant blue bat intelligent enough to read books. Social Services Does Not Exist: They apparently do. Which is why Lave is confused about Jake being given to her. Obstructive Bureaucrat: Gena is this for Lave, though Gena would probably not agree. Man Bites Man: Jake bites Lave after she grabs him and her finger gets a little too close to his mouth. Promotionto Parent: And Lave's not happy about it. Sinister Subway: The 'shortcut* Lave takes Jake down later. Secret Shop: Where most of the chapter takes place. Bazaarofthe Bizarre: The market area Lave takes Jake to is full of none human creatures.